When buying a home, buyers may not realize what they should or shouldn’t be doing, and most times may not know how to go about the process. Even those who have purchased a home before, the market changes, the laws change, things just change, so this list is good for anyone looking to purchase a home. 1. 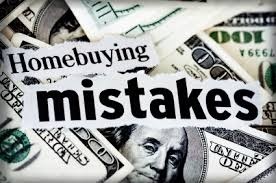 Not having your own Buyer’s Agent or representation – This is the most important mistake made by so many buyers. Buyers believe that calling the listing agent directly will be better or save them money. Most times that is not the case. Having your own representation is vital as in the state of Florida (and many other states) you can not represent both parties and give them full disclosure. Meaning we can represent both the buyer and seller yet we have to remain neutral so that we are not disclosing to either party something we may know, such as the seller will take less for the house or the buyer will pay more for the home. But when you have your own representation, the agent can give full disclosure to the buyer with any information they know about the seller and the home. 2. Looking at homes PRIOR to being pre-approved – There are many reasons why you shouldn’t do this, but I will just name a couple here for you. First and foremost, you wouldn’t want to go shopping for a home, find the one you love, only to find out it’s over your price range and you can’t afford it. That would put you in a negative mindset right off the bat and end up not making your supposed to be “fun” experience, potentially a sour one. Second, most sellers in today’s market won’t even consider your offer without your pre-approval, so looking at homes beforehand is a waste of everyone’s energy and time. 3. Not disclosing ALL information to your lender – You must share everything and anything you know about your financial background so that the lender knows everything up front. Without all of that information you leave yourself vulnerable during the home purchase and in a position where the entire deal may fall apart as whatever you may be hiding, or forgetting, will come up whether you want it to or not. Financial institutions have tightened up since the “crash” in the mid-2000s and guidelines are much stricter, so you need to disclose everything you can think of to your lender. 4. Using an agent who can’t properly represent you – If you’re agent doesn’t communicate with you in a timely manner, that’s a huge red flag. They should have knowledge of the area or know how to properly fill out a contract. Be sure to use an agent with experience and skills to represent you the best. I’ve seen agents who don’t represent their clients properly and those clients end up loosing thousands of dollars in the end. 5. Failure to verify permitting or potential code violations – Unfortunately the agent can not verify this information for you. Mostly because if they speak to someone who gives them incorrect information and then relays that information to you, you can blame the agent for giving false information. So, as a buyer, you always want to verify your own information and permitting, and code violations are one of them. Now, most times the title company will do that work for you, but you want to confirm it is being taken care of. 6. Not getting a home inspection done – BIG Mistake! A home inspection can reveal things not seen by the naked eye, such as plumbing issues, a roof leak, electrical issues and so much more. There are other inspections your agent should recommend depending on the home and what is needed, but a home inspection is a must. Even if you are in an “As Is” contract where the seller won’t fix, repair or replace anything, this at least gives you the opportunity to know whether to move forward or, at the very least, have a punch-list for when you move into the home and the repairs you can make yourself. 7. Trusting the Seller and not getting a Seller’s Disclosure – Even though it is not mandatory nor required (in the State of Florida), it’s good to have and see what may be wrong with the home prior to going under contract or doing inspections, as if there is something you are not alright with, you can discuss that upfront with your agent or the seller and see if it is something the seller would be willing to repair or replace if needed. 8. Making major purchases before you close on the home, which could hurt your credit and debt-to-income can increase, in turn hurting your chances to buy the home. When you have your initial conversation with your lender or financial institution, they should give you information on what NOT to do when you are buying a home. Purchasing anything, such as a new car, or even appliances for the home, could hurt your chances to end up closing on that home. So, ask the lender what NOT to do, if they don’t share that with you themselves. 9. Verify utilities, such as on public water or sewer, or on well water or septic. Also check assessments with the city if recently switched over from well or septic to city water or sewer. If it is on septic, you would want to get that inspected. Also, if there are assessments for being recently switched over to city water or sewer, you want to know that as many times the seller will ask the buyer to pay off the balance as you are now the one going to be using it. It is more common than not for a seller to ask that, yet this is still something you want to know going into the purchase of the home, so you are prepared. 10. Not knowing the different programs available for buyers in your area – Most buyers, even ones who have purchased a home before, may not know what is being offered in the state or even county they are purchasing a home in. Ask your agent, ask your lender and do some research to see if there may be something out there to help you either with closing costs, your down payment or a type of loan you can qualify for. Now you know what mistakes NOT to make as a buyer when purchasing a home. If you want proper representation, have questions, or are ready to make a move to buy a home, contact us today, The Von Ohlen Team. We are here to help you and have the experience and knowledge to do it right the first time.